Goodwill’s culinary arts training program is an 8 to 12 week training course that is certified through the American Culinary Federation (AFC) and taught in a fully equipped and approved industrial size kitchen. It provides culinary arts training and employment assistance to homeless individuals and recently released incarcerated individuals. 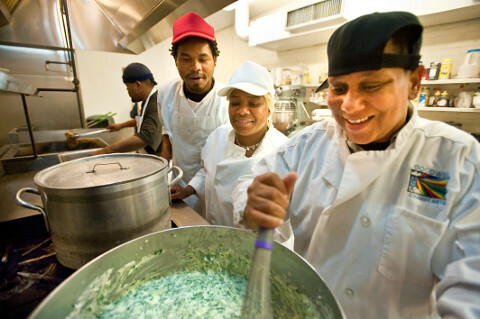 Classes are conducted in a working kitchen, Monday through Thursday, 8:30 AM – 4:30 PM. Support staff includes case managers and job coaches, as well as employment assistance coordinators. The Culinary Arts Program is a Unity of Greater New Orleans program and not a part of Goodwill’s Training Center certification programs. Rules & regulations as well as hands-on operation of equipment, utensils and food preparation. Proper storage techniques and sanitation principles. Soup, sauces, baking, food preparation, breakfast cookery, basic cuts of meat and butchery. Regional cuisine, as well as general basic large scale food production techniques. After completion of required courses, student will receive a certificate of completion, as well as assistance with resume writing and job placement. Goodwill’s training program has graduated more than 700 students and its graduates are successful employed at fine dining restaurants, hotels, casinos, hospitals, hospitals colleges and offshore vessels.